The beautiful sandstone portal was completed in 1768, and today it delights both locals and visitors. 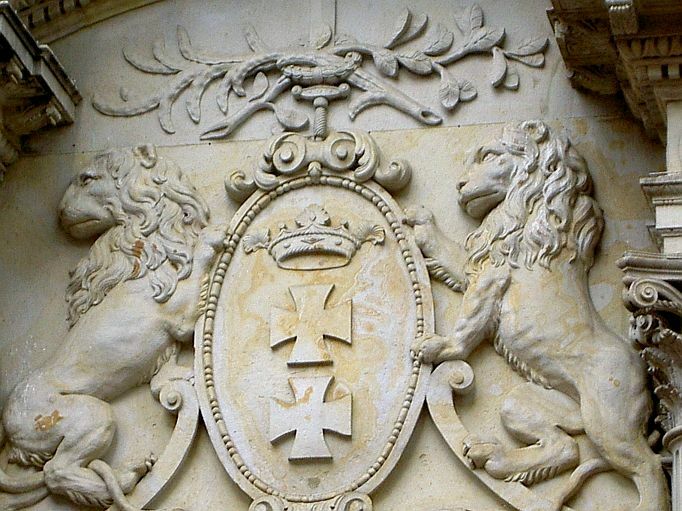 It’s just a portal, one might say; one of many in the city… It presents Gdansk’s crest with lions, as heraldic holders. But it differs from other depictions of the crest. Here the heraldic lion on the right (heraldic right is the VIEWER’s left) has his head turned towards the Golden Gate (the Long Street Gate ). Anyone talking about the portal would say that it was made a few years before the First Partition of Poland (the date can be seen on the sides of the portal. 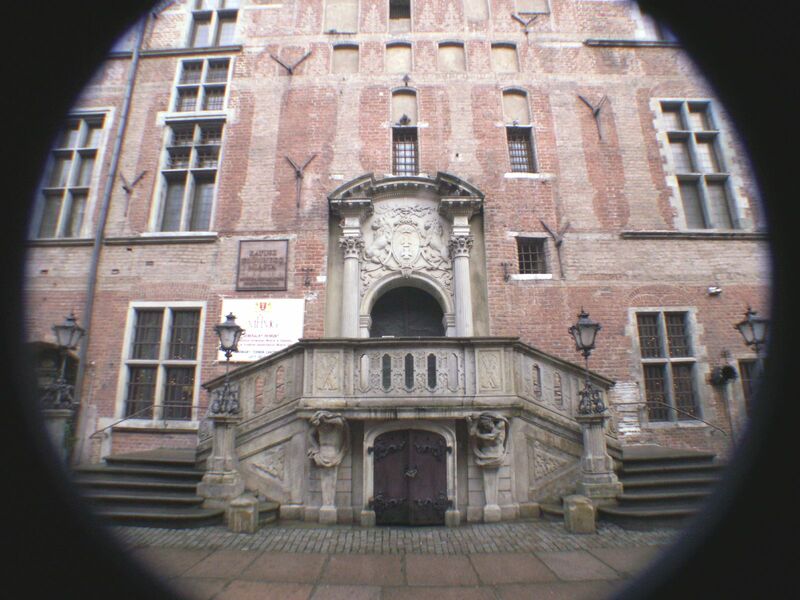 It is also said that the portal was made in an atmosphere of tension and threats to the Golden Gdansk and that the turned head of one of the lions symbolizes the faith of people from Gdansk in the intervention of the Polish king (which did not happen). The maker of his portal is known. Daniel Eggerts, or Eggertsen, or Eggersen. He was a descendant of Swedish immigrants, of which many lived in the city. He was born in Gdansk in 1732, so at the time of the creation of the portal was a mature man. The precision in the use of sculpture tools he obtained at the workshop of Christopher Strzycki (about this master of the chisel I will tell some other time). After studying with the master – Daniel following the custom, went abroad to improve his skills. He sought inspiration in Russia, Holland, Sweden – a country of his ancestry, France, Denmark, and England. During the 3-years stay there, he made of white marble relief of “The Sacrifice of Iphigenia”. The work was exhibited at the Society of Independent Artists in 1762 and as early as next year, gained the prize from London Society of Arts. After this success, Daniel returned to Gdansk in 1765. Here he immediately received from the City Council a large order for the execution of the Town Hall stairs and portal. Gdansk loved allegories and symbols, and such a presentation was expected from Master Daniel. The work was supposed to force thinking and was supposed to be difficult in reception, though was also supposed to render the moods of the City Council in the Town Hall. Master Daniel perfectly fulfilled the task. And the result of his work can be admired today.